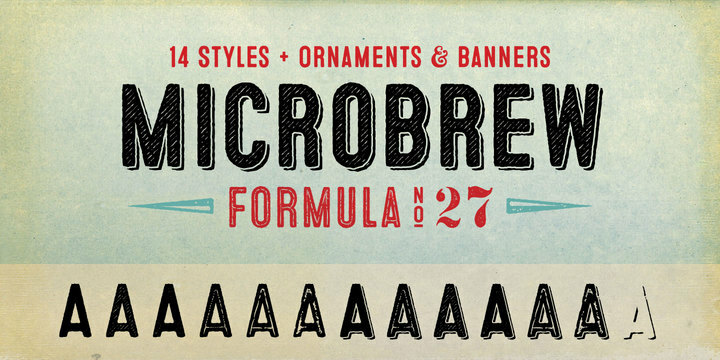 Microbrew is a sans serif typeface created by Jay Hilgert and published by Albatross that contains 14 styles plus ornaments & banners. This versatile retro display family has Lowercase alternates, double-letter ligatures, automatic opentype fraction, subscript & superscript numbers. Also it has multiple language support. It is ideal for display, headline, newspaper, poster etc. “Microbrew” is a trademark of Albatross. A font description published on Monday, March 31st, 2014 in Albatross, Fonts by Alexandra that has 8,810 views.